Ōsaka-shi, or Osaka as we English speakers spell it, is the second largest city in Japan. Its metropolitan area, which includes the adjacent city of Kobe and the nearby city of Kyōto, is home to over 19 million people. 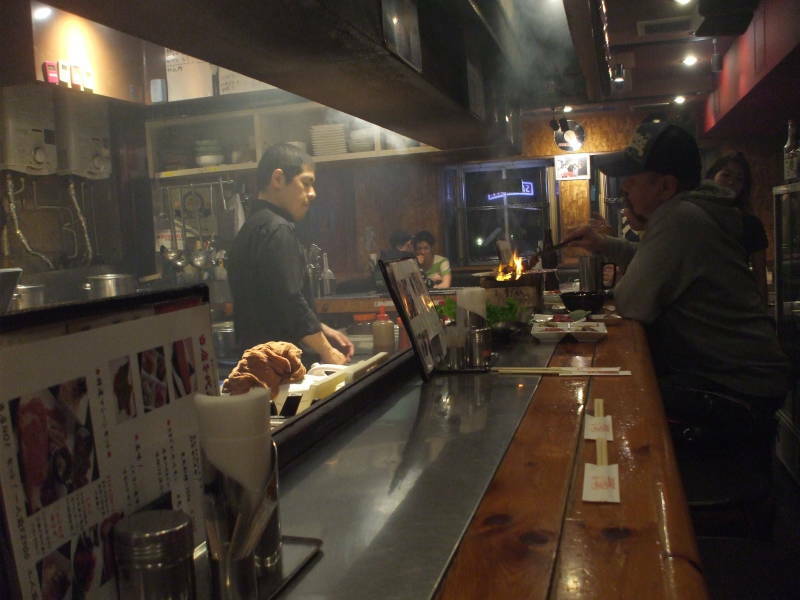 Osaka has been "Japan's kitchen" and a major business and industrial center for centuries. It was the center of the rice trade during the Edo Period of 1603 through 1868, when the Tokugawa shōgunate ruled Japan while the Emperor lived in Kyōto with little power. 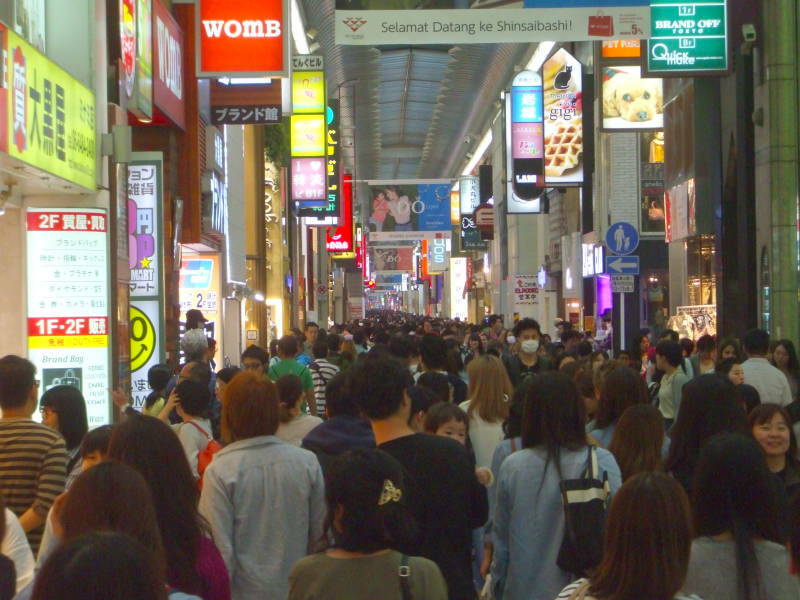 Now the GDP in the Osaka-Kobe-Kyōto area is US$ 671 billion, putting it at #7 world-wide. People lived here at the mouth of the Yodo River long before history started being written down. By the 6th century BCE there were settlements that left mounds of shells and human burials. By the Kofun Period of about 250 BCE to 538 CE, Osaka's port connected its region with western Japan by sea. The kofun, the megalithic passage graves built in the area, grew larger and larger as political power concentrated here and evolved into a government. In 390-430 CE there was a Imperial palace in what today is a ward of Osaka. In 645 the Emperor Kōtoku built a palace in Osaka, called Naniwa at the time, and made it the capital of Japan. Just 10 years later the capital was moved inland to Asuka, but then in 744 the Emperor Shōmu briefly returned the capital to Naniwa. Before the Nara Period, the capital moved at the death of each Emperor. National government in the form of the Emperor remained in Nara through most of the 700s, then moved to Kyōto in 794 and stayed there for several centuries. Naniwa was the nearest port to both those Imperial capitals, and this made it Japan's economic center. Its name changed. Written records refer to it is as Osaka at least as far back as 1496. When the Shōgunate ended and the Emperor returned to power in 1868, in the Meiji Restoration, the government moved to Edo. The small city of Edo soon was renamed Tōkyō and later grew to be the nation's largest city. Osaka, however, became the industrial center. 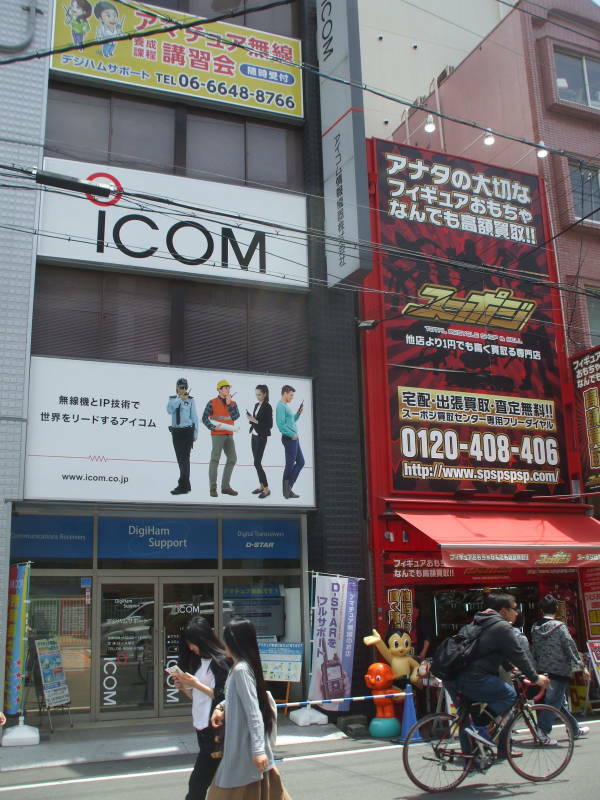 While many corporations have moved their main offices to Tokyo, several are still based in Osaka. The high speed Shinkansen stops at Shin-Osaka Station, well to the north of the center. There are several other major train stations throughout the city. I arrived from Nara by train at Namba Station. That's in the Minami or "South" district of the city. That's south of the "downtown" area but still roughly central within the overall metropolitan area. 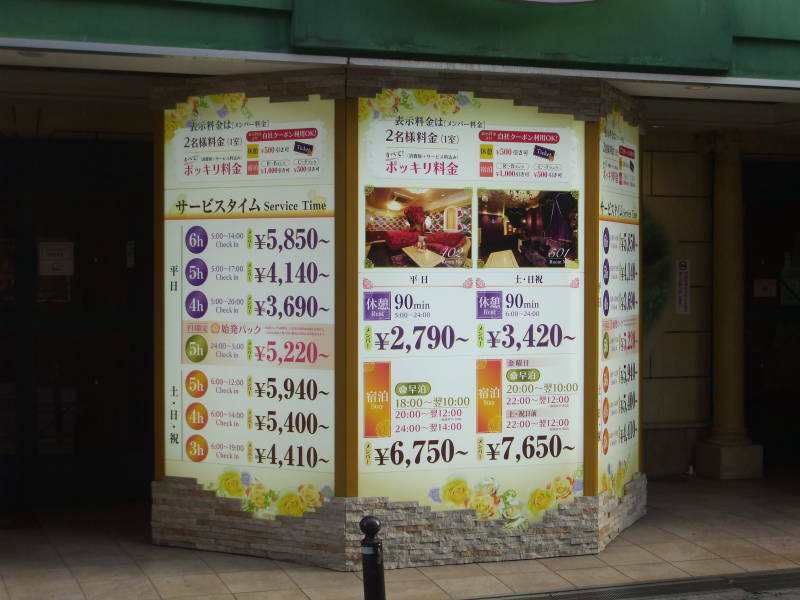 It's an interesting area, and there are cheap places to stay including capsule hotels. 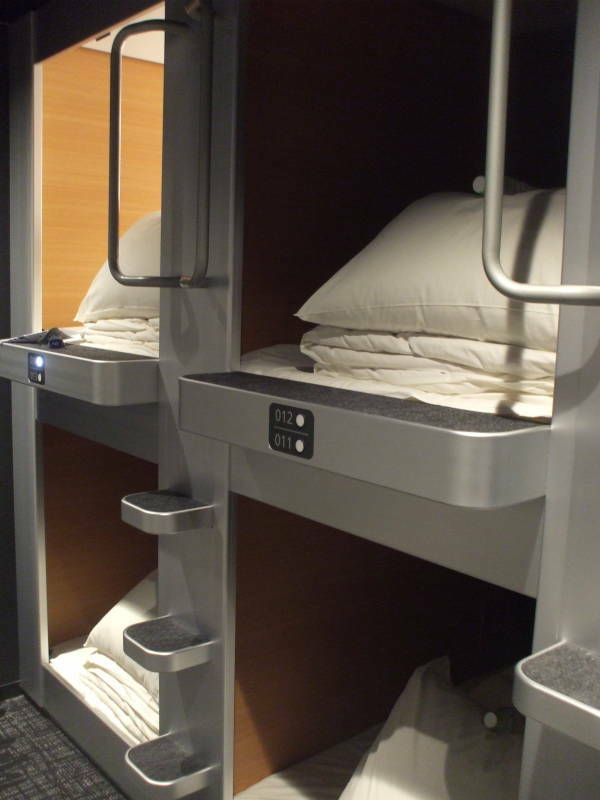 The capsule hotel, locally called a kapuseru hoteru or カプセル ホテル, was invented in Osaka. The Capsule Hotel Osaka opened in 1979. The "rooms" in these are really capsules or pods. The capsules in the hotel where I stayed are modules about 1.25 meters wide and a little higher than that, and at least 2 meters long. I'm a big guy, 190 cm tall and significantly larger than the average local, but I had plenty of room. I thought my feet might hang out, but the capsule provided maybe 20 to 30 cm of length to spare. 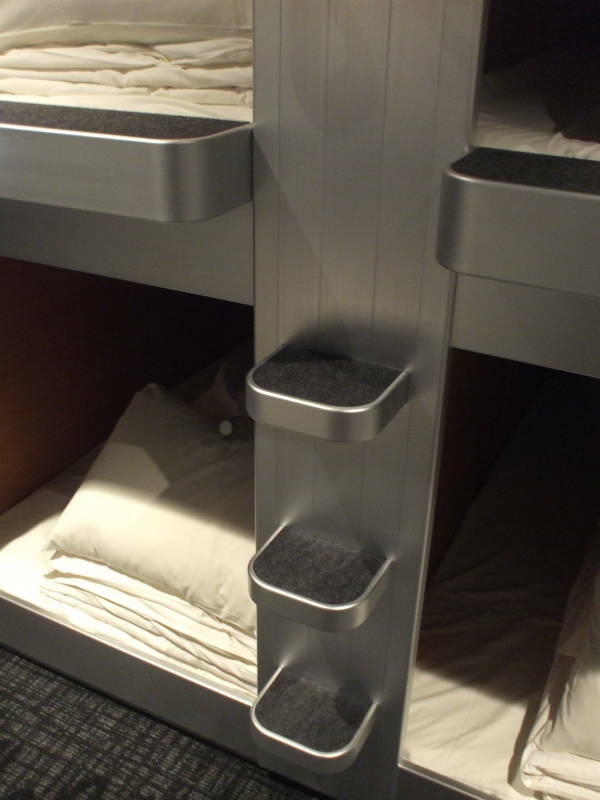 The capsules are stacked two high in most capsule hotels, three in some, with steps and hand rails leading to the upper ones. Find your capsule and press the button next to its number. That turns on some lights so you can see to climb in. Once inside there are controls for two sets of lighting. 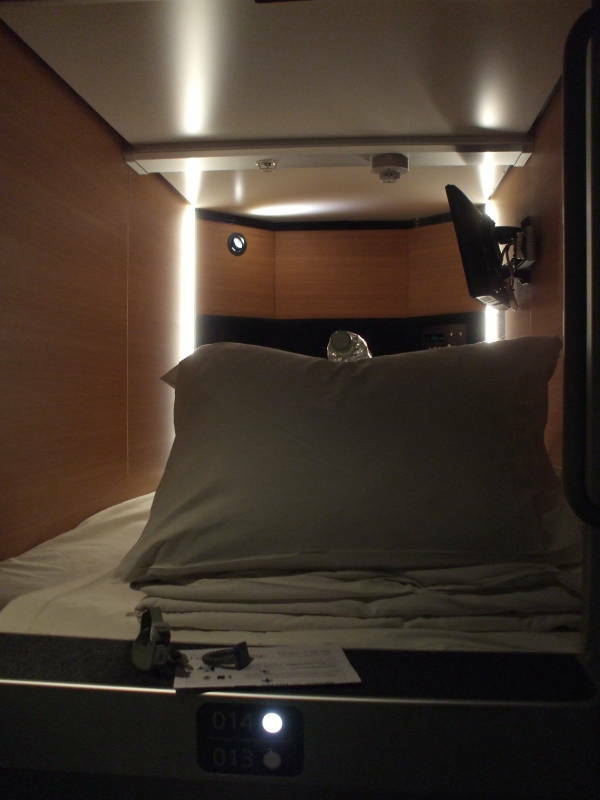 The one I stayed in was typical, with a TV panel folding out from the side wall on an arm. There was an electrical outlet for recharging my phone. It's reasonably private. There is a plastic or canvas blind that you pull down from the top of the opening. Capsule hotels were originally just for men. They were compartments for drunken salarymen. 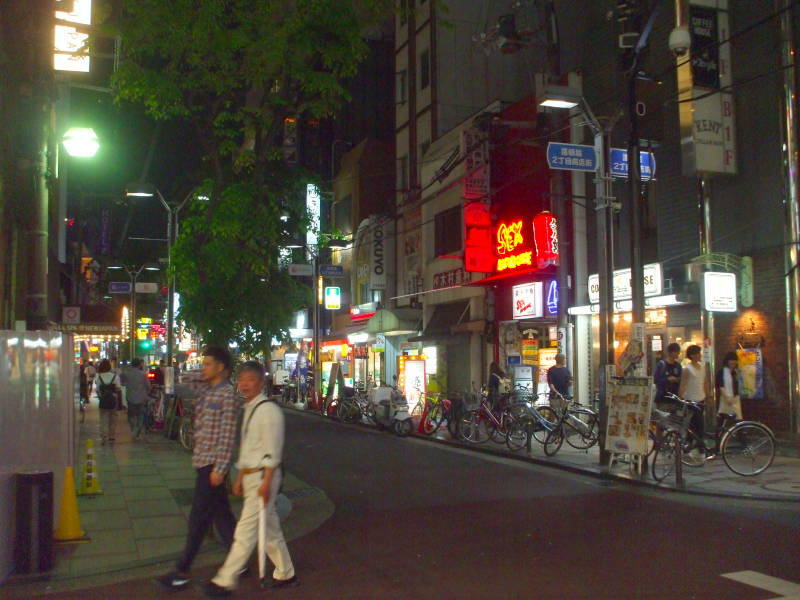 Japan has amazing mass transit, but in all cities it shuts down around midnight. Capsule hotels are clustered around major train and subway stations, for men who missed the last train. Or, who are intoxicated enough that they will either have trouble getting home or get into trouble if they do get home. You can pay slightly more for a floor-level capsule where you can simply crawl in and out. That way you wouldn't have to deal with the ladder steps and handrails. 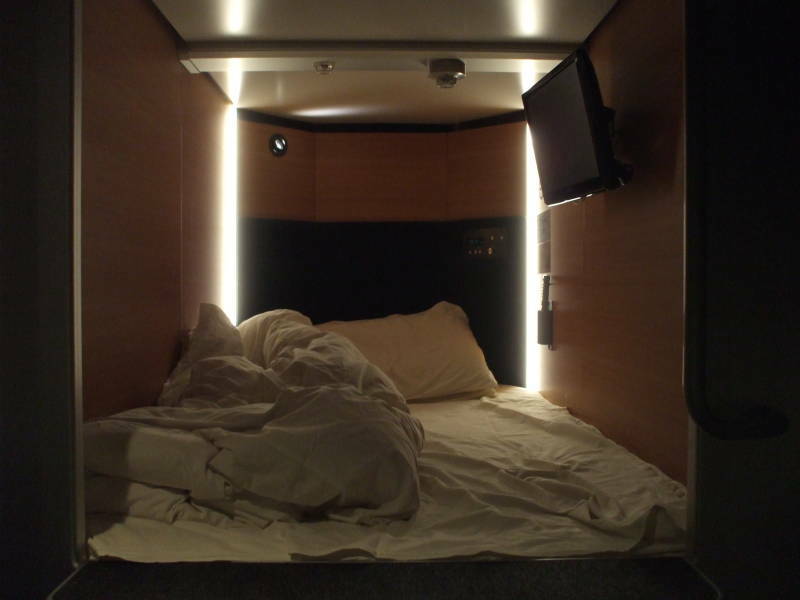 A few capsule hotels now exist for women, catering to the tourist trade. The majority, however, are still men-only. All of them have strict rules against guests with visible tattoos. In Japan, tattoos are associated with the yakuza, organized crime. Versus in the U.S., where tattoos are associated with seasonal employment with a carnival. Any lobby, if it exists, will be small. Very close to the door the floor will transition to wood or tatami mats and you must remove your shoes. 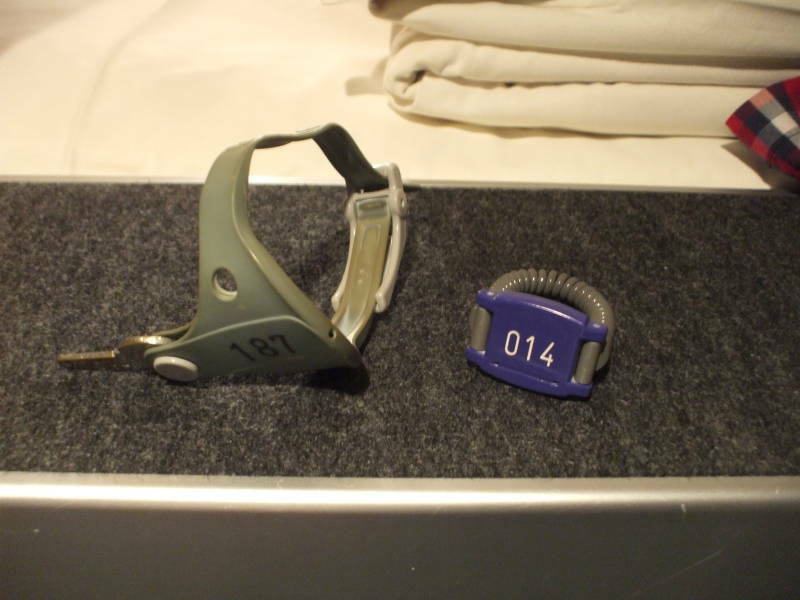 Once you have checked in, you will have a card with your name, shoe locker number, and sleeping capsule number. You keep the shoe locker key when you go out. When you return, you store your shoes. 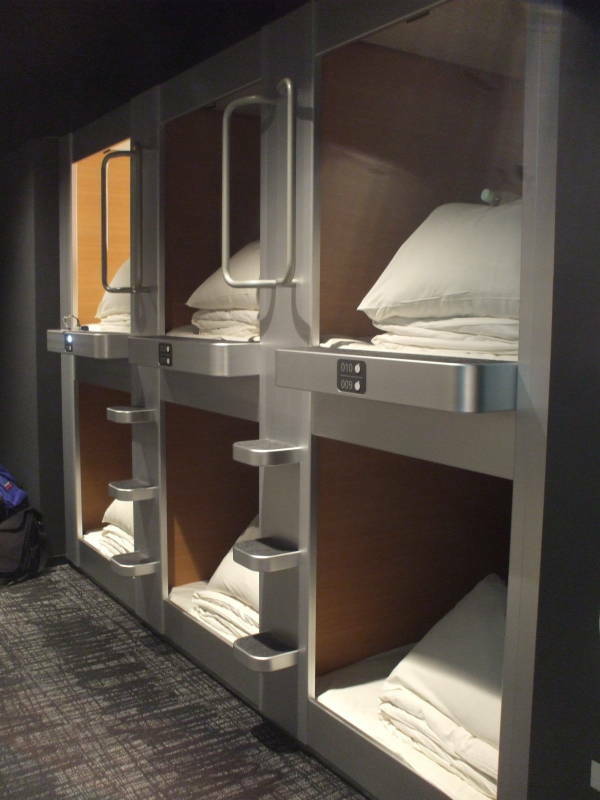 Then you show your card and trade your shoe locker key for the keys for your clothes locker and the sleeping area. In the picture above, the clothes locker key is on an odd rubber bracelet gadget so you don't lose it when you go to the shower or bath area. The small blue piece is a proximity device, a wireless gadget that unlocks the doorway into the sleeping area when you hold it close to the reader. Take it with you when you go out to the area with toilets and sinks. 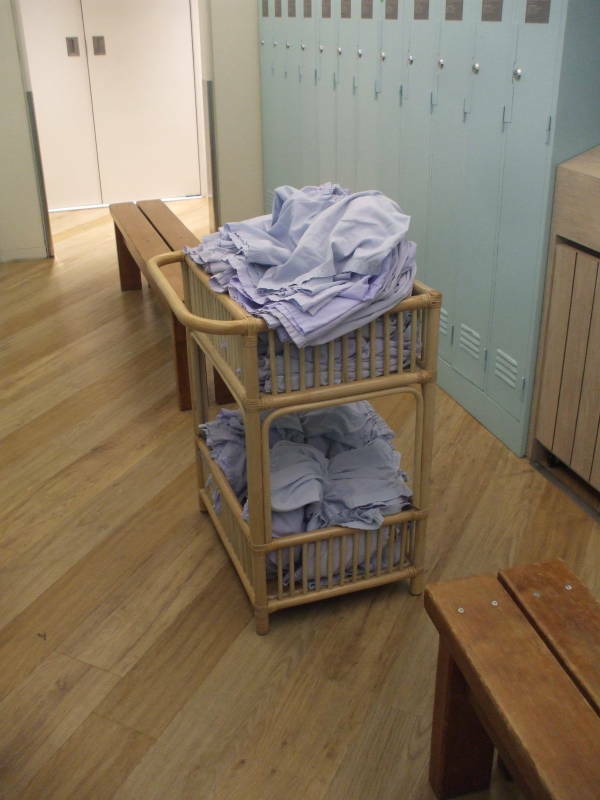 First, though, on the way in you change out of your street clothes in the locker area, changing into provided cotton shorts and T-shirts stacked there in baskets. Maybe also a yukata, a casual lightweight kimono. You lock your street clothes, wallet, etc., in your locker. I have stayed in some odd but interesting places, including converted flophouses (or really SRO or single-room occupancy hotels) and in tiny guesthouses in Hong Kong, but the capsule hotel was, in some ways, the strangest place I have stayed. The patrons weren't down and out, renting a capsule by the week or month as the New York Times described. Nor were they too incapacitated to get home. I happened to be in Osaka over a weekend, Friday through Monday. It seemed to me that many of the men were spending the weekend there to pamper themselves. I left one morning and then came back mid-day to pick up my Rough Guide guidebook, only to find that there were about as many men lounging around then as there had been late in the evening or early in the morning. There were rooms with toilets, urinals, and sinks, with mirrors for shaving. But then there were also rooms that seemed to be for primping, with a row of chairs like in a barber shop (or a beauty shop) facing well-lit mirrors and counters with various oils and salves and unguents. Speakers overhead in the shared areas played soothing New Age style music. There was a large room with white reclining chairs, maybe five rows of ten each. Each recliner had a small TV screen on an adjustable arm. The front of the room was lined with bookshelves filled with anime DVDs and manga or comics. It took me a day or more to figure out what it reminded me of. Finally: A YMCA operated by the Soylent Corporation. 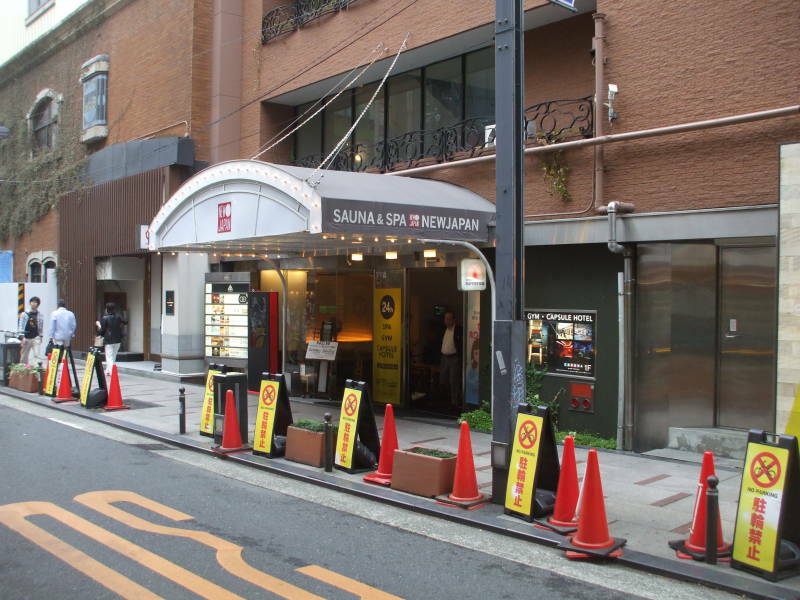 But meanwhile it was a relatively low-cost place to stay in Osaka, where the capsule hotel was invented. OK, I've had a good night's sleep, let's go back out and explore Osaka. Cleaning staff will come around and replace the bedding and bring a fresh water bottle. But first, some historical context. General Motors operated a factory called Osaka Assembly starting in 1927. The plant was on the waterfront, and had its own test track and Shintō shrine. It built Chevrolet cars and trucks, Buicks, Pontiacs, and Oldsmobiles. The plant had nearly 300 employees and produced over 100,000 vehicles in its first 10 years. 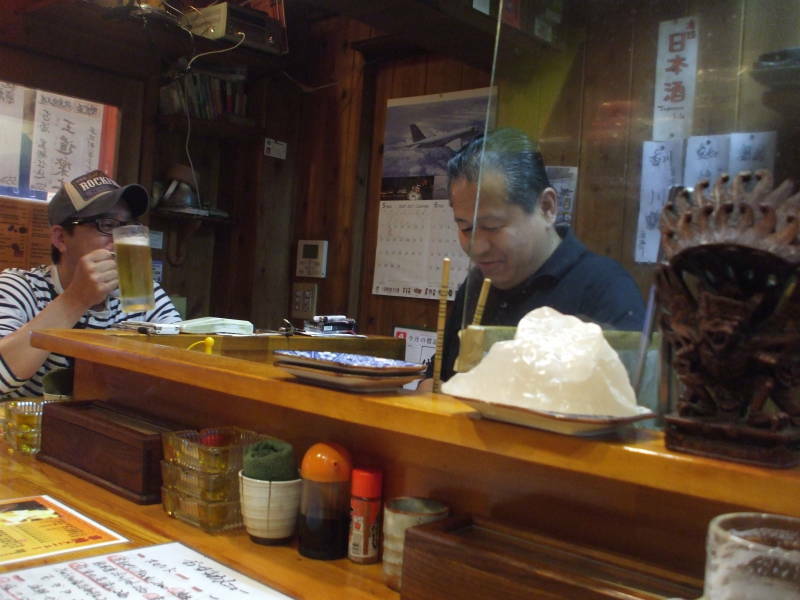 The employees were paid well and had both Saturdays and Sundays off, very uncommon in Japan at that time. In 1936 the military-controlled government issued new rules requiring auto companies to be at least 50% owned by Japanese nationals, and limiting foreign manufacturers to less than 3,000 vehicles per year. The government was concentrating production on trucks to be used in the war already underway in China. Japan invaded Manchuria in 1931 and annexed more territory in China in 1937. Germany invaded Poland on the first day of September, 1939, the start of open warfare in Europe. In September 1940, Japan joined Germany and Italy in the Tripartite Pact. In July 1940, the U.S. banned shipments of aviation fuel to Japan. In September 1940, Japan invaded French Indochina. In 1941 the government seized the General Motors plant. The U.S., Great Britain, and the Netherlands had imposed an embargo on gasoline shipments to Japan in July 1941. Then on 7-8 December 1941, Japan attacked the U.S. Navy base in Pearl Harbor (where it was still the 7th), and within the next seven hours attacked and soon captured British territories in Singapore, Hong Kong and Malaya, and U.S. bases in the Philippines, Guam, and Wake Island. The war's approach had been obvious. The U.S. Army Air Force had planned to bomb Japan from Guam, Wake, coastal China, and the Philippines. However, Japan had rapidly seized all those areas. There was the Doolittle Raid in April 1942, when the U.S. launched B-25 Mitchell medium bombers from an aircraft carrier. They dropped bombs on Tokyo and the nearby Yokohama and Yokosuka, on Nagoya, and on Kobe, close to Osaka. The bombers continued on to land in China and the Soviet Union. The raid was mostly for psychological effects, for both the U.S. and Japanese public. But it did increase pressure on the Imperial Japanese Navy, which soon suffered its first major defeat in the Battle of Midway. In 1943 the U.S. came up with a plan to base the B-29 Superfortress heavy bombers, which were still being developed, in China. The bombers would first be based in India while forward airbases were constructed at Chengdu in central China, far inland and thus at less risk of attack. The B-29 had a 1,600 mile combat radius, so they could only reach the southernmost large island of Kyūshyū. One alternative had been a base in Guilen, within range of more of the Japanese Home Islands, but itself closer to the coast and thus at greater risk. Japan never had many defensive fighter aircraft, and what they did have couldn't fly at the speed or 30,000 foot altitude of the B-29. Nor did they have many anti-aircraft guns. Japan had some radar systems, but those had short ranges. Japanese SIGINT could intercept bomber radio communications if bombers were within radio range, but they couldn't tell where they were or where they were going. The fire services were mostly volunteers with little training or equipment, and less than 2% of the civilian population had access to air-raid shelters. None of that really mattered early in the war, when U.S. bombers were kept far away by Japan's rapid seizure of territory. Things got much worse for Japan during the war. The U.S. began flying bombing missions against Japan in June 1944, flying out of Chengdu against targets in Kyūshyū. The ninth and final attack launched from Chengdu was in January 1945. The Chengdu operation was not really successful. The B-29 was operating at the limit of its range, and crews had to deal with heavy cloud cover and high winds once they reached the target. They destroyed the aircraft factory in Ōmura but accomplished little else. U.S. Marine Corps and Army forces captured Guam, Saipan, and Tinian in the Mariana Islands during June through August 1944. USAAF and U.S. Navy construction groups began building six airfields. The Marianas bases were 1,500 miles from Tokyo, and most of the Home Islands were now within range of the B-29. On 1 November 1944 a photo-reconnaissance version of the B-29 flew over Tokyo, the first U.S. aircraft to do so since the Doolittle raid of April 1942. Bombing raids from the Marianas began on 24 November 1944. Continuing through the following March, bombing raids alternated between precision attacks with high explosives against industrial targets, and area bombing with incendiary bombs. High winds and cloud cover through the winter kept the bombing raids from accomplishing much. USAAF planners had estimated that incendiary raids against the six largest cities in Japan would damage about 40% of industrial facilities, negate 7.6 million man-months of industrial labor, kill over a half million people, and leave close to 8 million homeless. The first massive fire-bombing raid hit Tokyo the night of 9 March 1945. 346 B-29s launched, and 279 of them dropped 1,665 tons of incendiary bombs. The resulting fires destroyed 16 square miles, 7% of Tokyo's urban area. It was the most destructive bombing mission of the war. Industry was spread through Japanese cities, which consisted largely of small buildings built from wood and paper. The cities were very vulnerable to incendiary bombing. 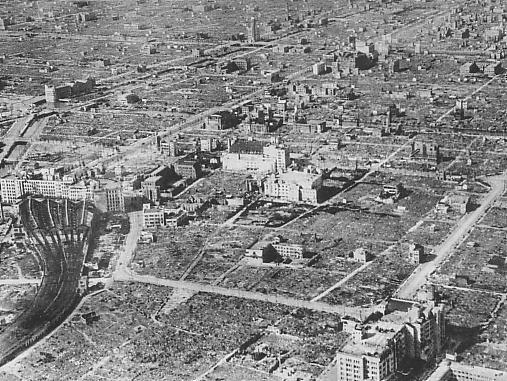 The 9-10 March incendiary raid on Tokyo destroyed a much larger area than the later atomic bombings. Similar large overnight incendiary raids hit other cities within the week. 310 B-29s hit Nagoya on 11-12 March, destroying over 2 square miles; 274 B-29s hit Osaka on 13-14 March, destroying over 8 square miles; then 331 B-29s hit Kobe on 16-17 March, destroying 7 square miles. Nagoya was hit again on 18-19 March, destroying almost 3 square miles. Then the firebombing had to pause because the USAAF had used all of the incendiary bombs they had in the Marianas. There was again a mix of daytime precision missions and overnight incendiary raids. Then, in mid-May, a major firebombing campaign began against the large cities. The attacks in the second half of May destroyed 94 square miles of buildings, one-seventh of Japan's urban area. The Japanese defensive fighter force was now even weaker because of high rates of training accidents and combat losses. Anti-aircraft batteries had very little ammunition. The B-29s also dropped mines. Those mines sank 293 ships, over 9% of all Japanese merchant shipping lost during the war, and 60% of shipping losses during the last five months of the war. Two atomic bombs were dropped, on Hiroshima on 6 August and on Nagasaki on 9 August. Those were the only two in the U.S. arsenal — a third could probably have been available by the end of August, and the plan was to have five more ready by November. A few days later, negotiations seemed to be stalled. On 14 August the final raid of 828 B-29s launched: daylight precision raids against targets at Osaka, Iwakuni, and Tokoyama, then night incendiary attacks on Isesaki and Kamagaya. Finally, on 15 August, Emperor Hirohito announced Japan's surrender over a radio broadcast. Namba Station and the surrounding area of Osaka in 1945. Osaka had been the most significant industrial city in East Asia, Japan's center of heavy industry. There was shipbuilding and railway locomotive and rolling stock construction, and metal production of iron, steel, copper, and aluminum. Factories produced aircraft parts, bearings, electrical equipment, munitions, machine tools, and textiles. It was also a hub of rail and ship transport. Osaka had first been bombed overnight 13-14 March 1945, with 8.1 square miles destroyed. The bombing raids continued until the last day of the war, when about 150 B-29s dropped about 100 1-ton bombs in a precision daylight raid. The incendiary attacks had destroyed about 40% of the total urban area across 66 Japanese cities. Kyōto and Nara weren't hit with incendiary raids. Tōkyō was large enough and diverse enough, with some rivers serving as firebreaks, to have some areas such as parts of Asakusa survive largely intact. But I didn't see anything in Osaka that looked like it was built before the war. The war is long over. Wow, things are completely different. No more militarism, kamikaze attacks, beheadings and vivisection of prisoners, or war crimes against civilian populations in occupied territory. 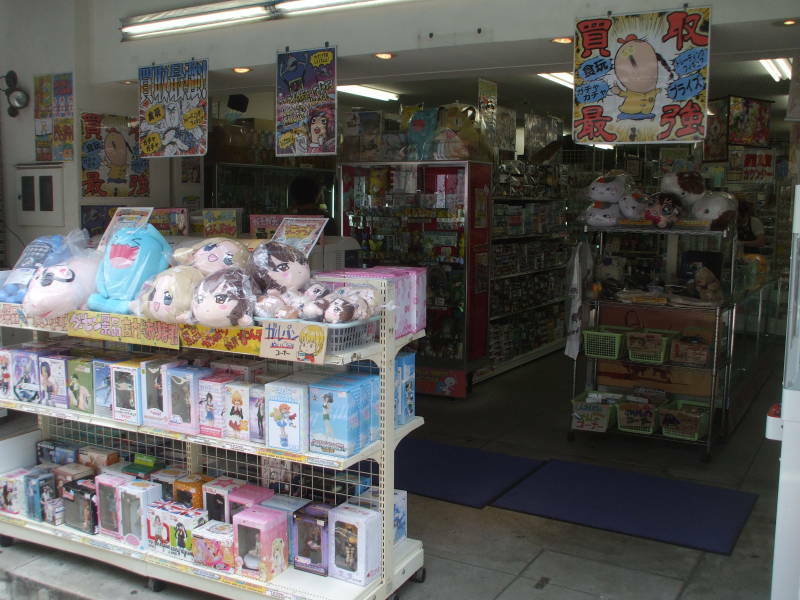 Now there's cosplay, otaku, maid cafes, and owl cafes. Things have gone from the strange to the differently strange. It's hard to connect the militarism of 1920-1945 with today's popular culture. 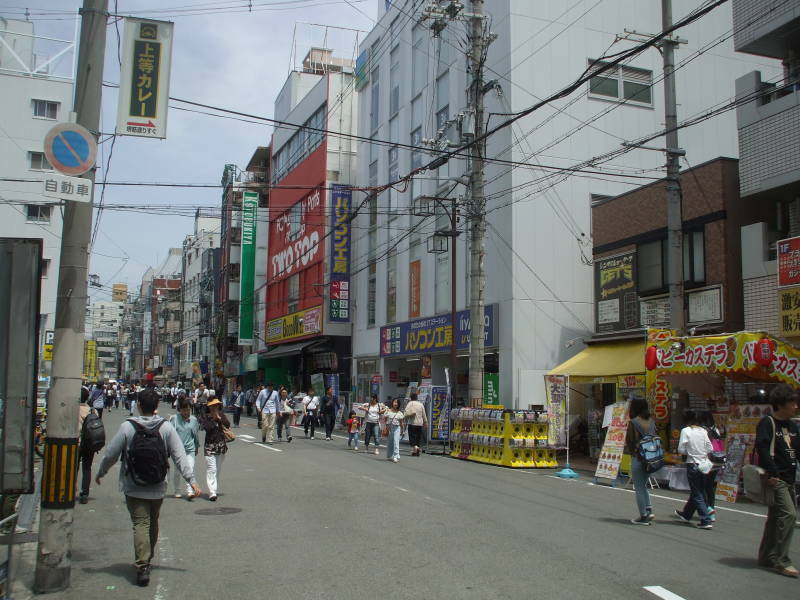 Den-Den Town, デン デン タウン or Den Den taun, is an area also known as Nipponbashi to the east of Namba Station. 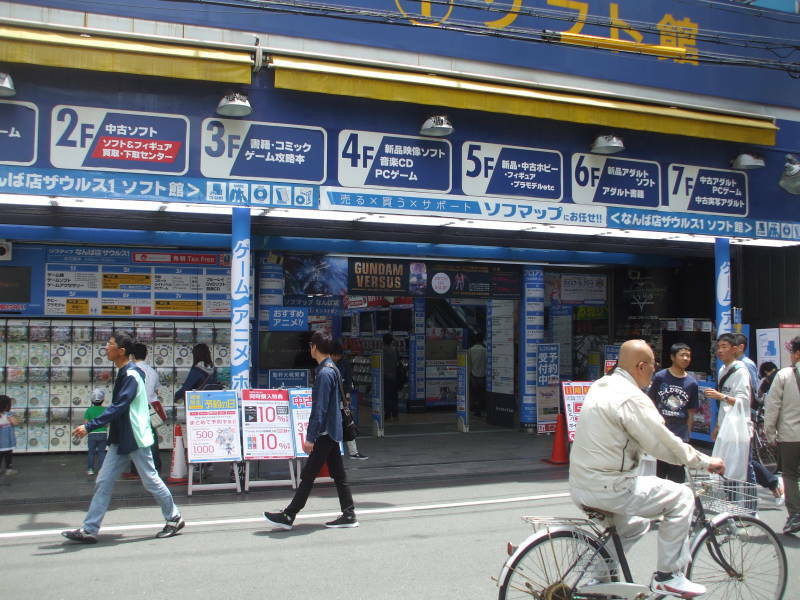 A consumer appliance shopping area was established here after World War II. "Den Den Town" roughly means "Electrical Town". That's still here. Many shops have home appliances and kitchen equipment. 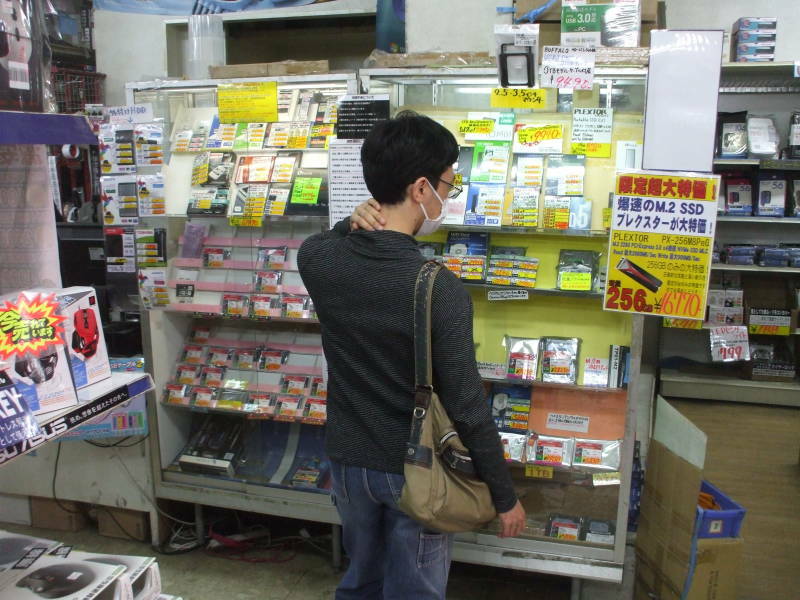 Other shops sell computer components: motherboards, processors, memory, storage, etc. 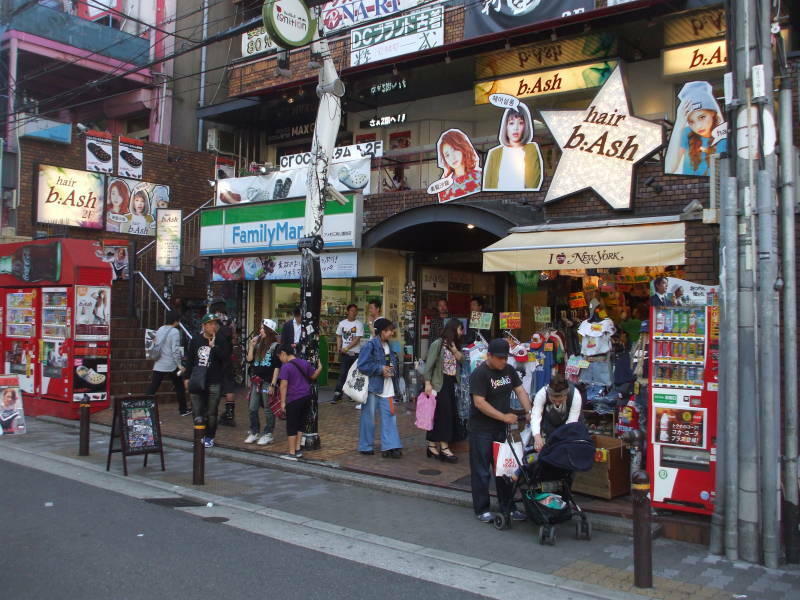 The area now also has many otaku businesses: anime, manga, collectables, maid cafes, and other maid-themed businesses. 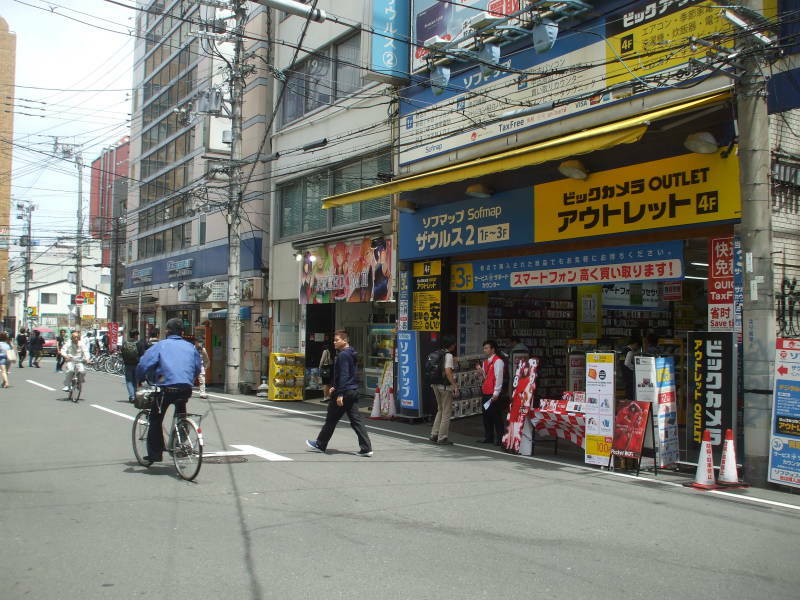 It's similar to Tokyo's Akihabara, at a smaller scale and intensity. 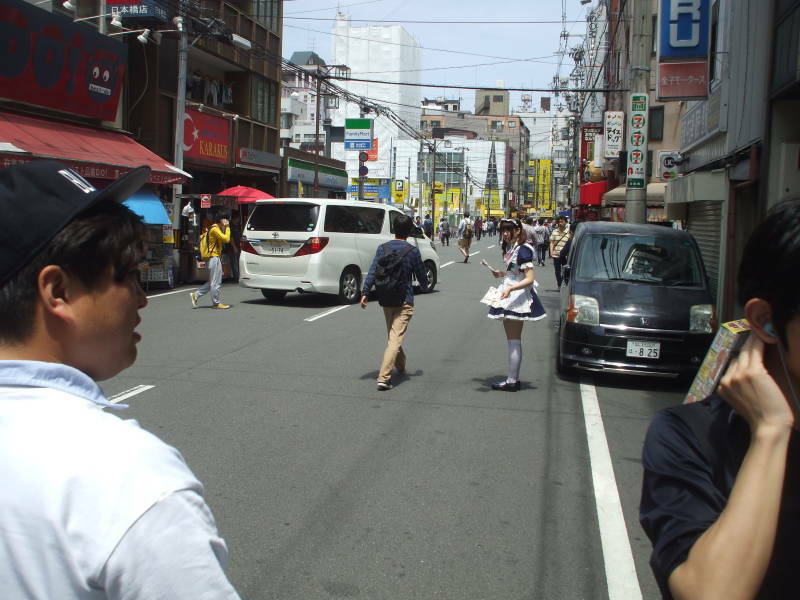 Girls hand out flyers for maid cafes. 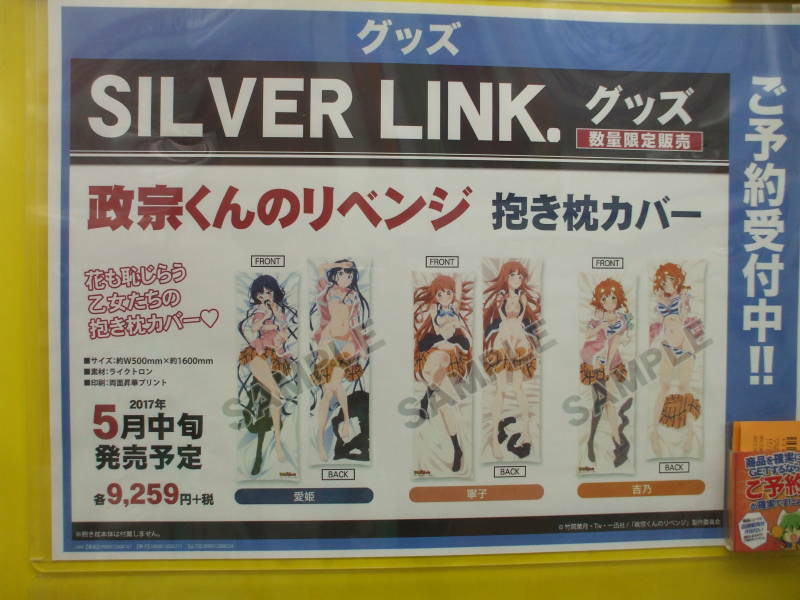 You can buy body-sized body pillow cases with anime girls. ¥9,259 is about US$ 85. 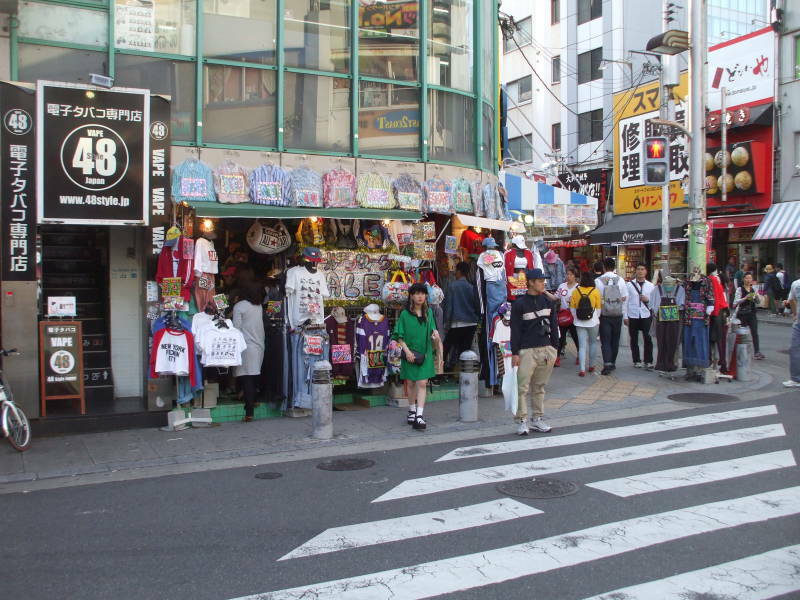 Amerika-mura, アメリカ 村 or just Ame-mura or アメ村 to the locals, is an entertainment and retail district north of Namba Station. 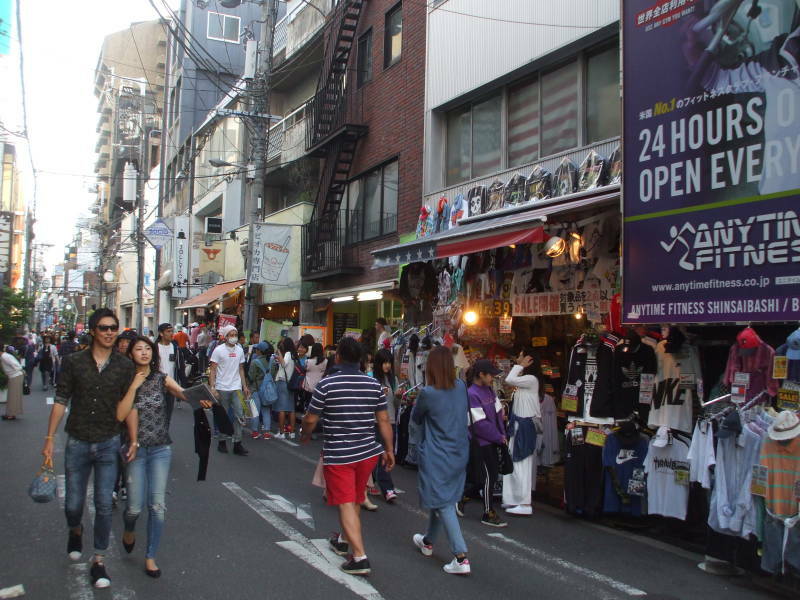 It's roughly parallel with the Shinsaibashi area, which is more high-end shopping. Ame-mura has designer goods, but it's more like Greenwich Village in New York, with much more of a pop culture orientation. The name comes from "America Village", Amerika mura, アメリカ 村. Immediately after World War II, shops appeared here selling Zippo lighters, T-shirts, and other American goods. 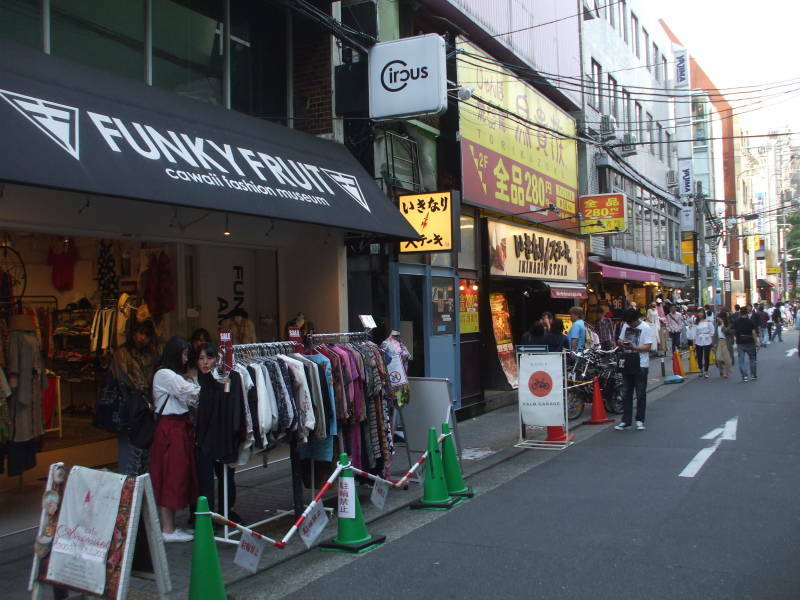 Many local shops today sell American style clothing, or at least what that is perceived to be in Japan. 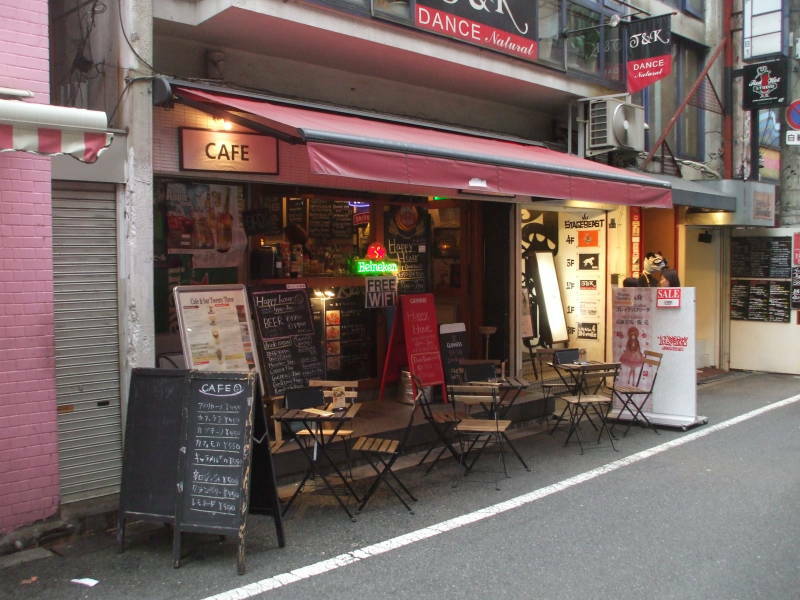 There are also small cafes, bars, and coffee houses. 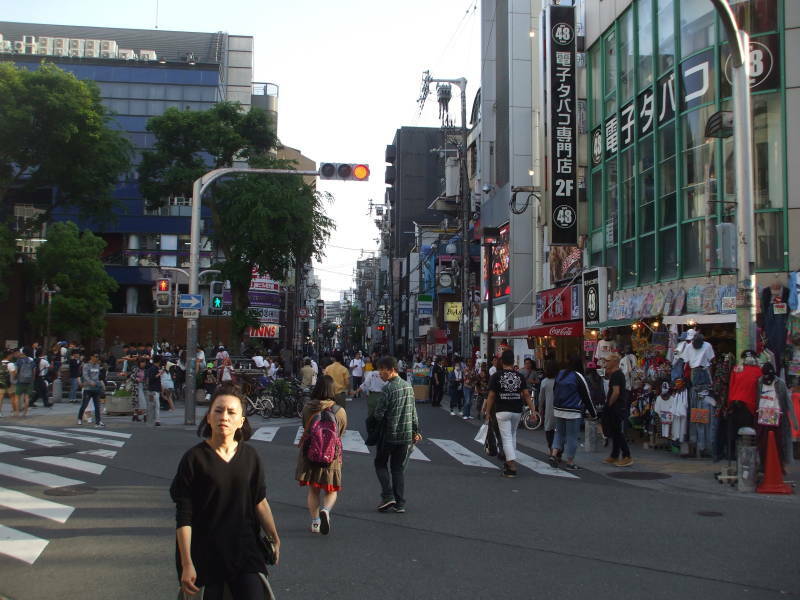 It's centered on Triangle Park, To-ra-i-an-gu-ru or トライアングル, where an east-west street crosses at an angle. The district is American themed in some ways, but most of the people working and shopping here are locals. 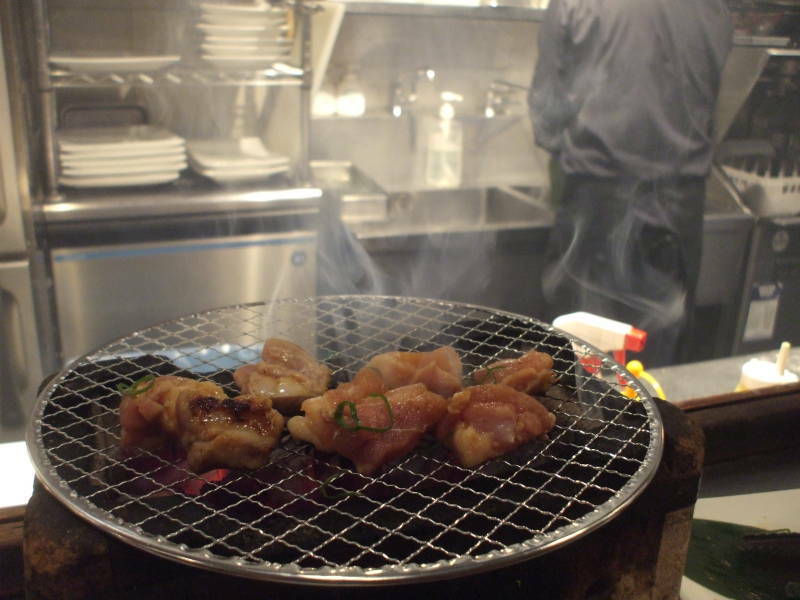 Osaka is known across Japan for its food. 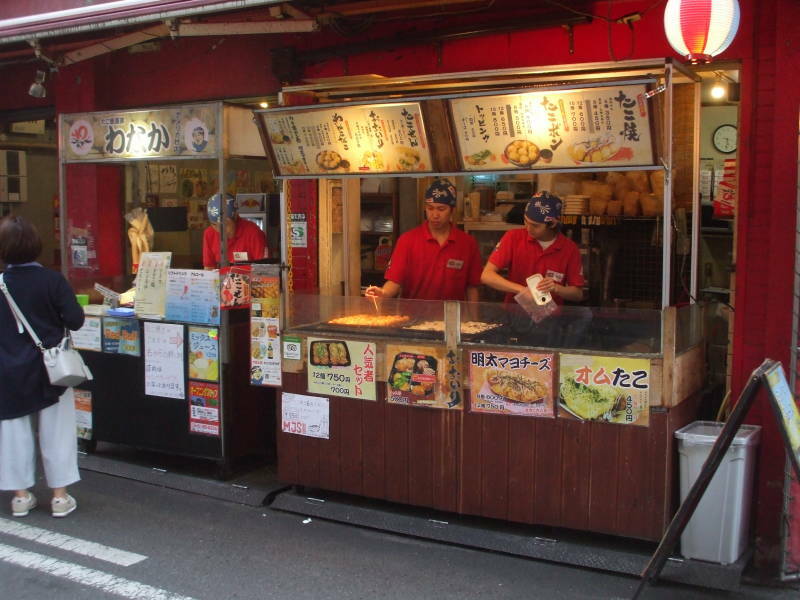 One Osaka specialty is tako-yaki or octopus fried in batter. Another local dish is okonomiyaki or pancakes with a variety of fillings. They are based on flour, grated nagaimo or yam, eggs, and shredded cabbages, and then are customized with your choice of seafood, onion, thin slices of pork, and many other possible ingredients. Okonomiyaki is popular throughout Japan, but they say that it was invented in Osaka. Udon is thick wheat flour noodles, also popular across the country. 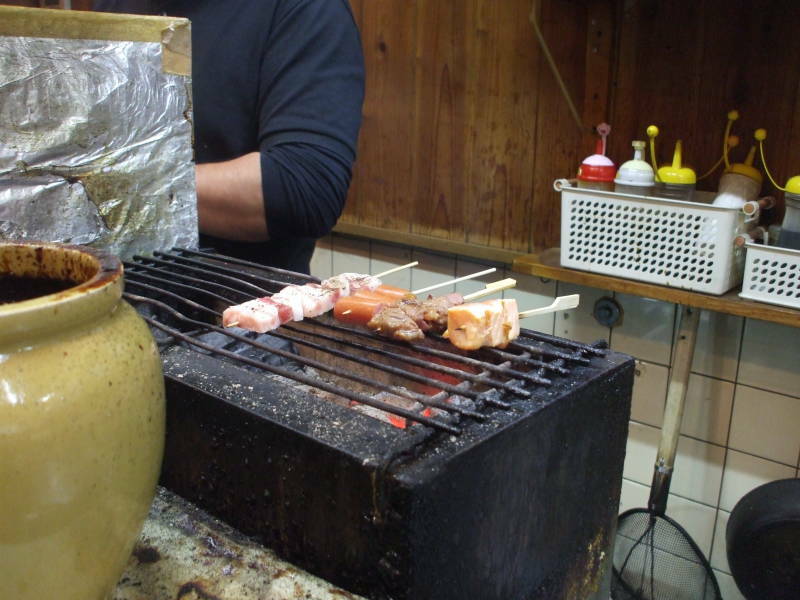 Like many dishes, udon is made in locally specialized ways including here in Osaka. 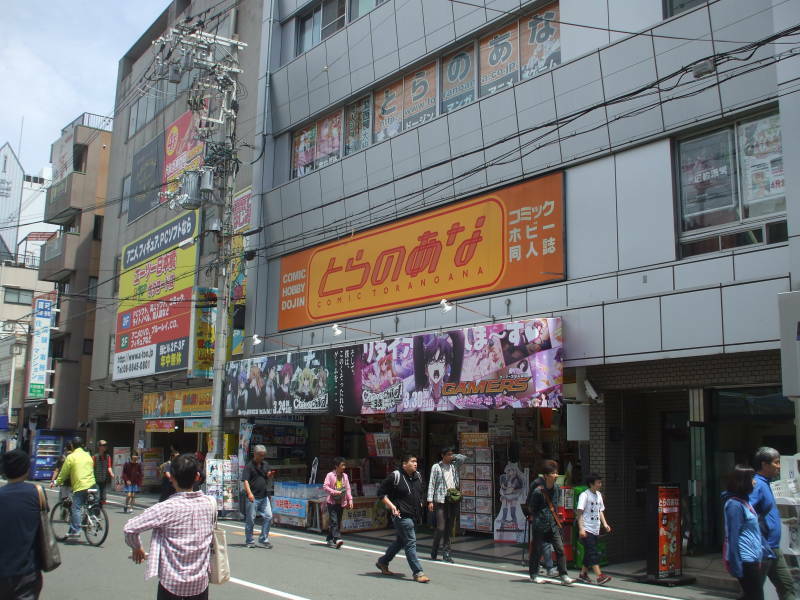 There are some love hotels in the Ame-mura and Dōtonbori area. Or as they're called locally, rabu hoteru or ラブ ホテル. You can spot them by their distinctive advertising and complex pricing schedule, with the costs for a "rest" and an overnight "stay" varying with start time. Love hotels are designed for romantic trysts. The concept goes back to the early years of the Edo Period, the time between 1603 and 1868 when the Tokugawa Shōgunate ruled Japan. Some inns and teahouses in Edo and Kyōto had specific procedures for discreet entry and exit, sometimes to the extent of excavating tunnels. After World War II the Occupation forces and the legality of prostitution made these establishments very popular around the Ueno district of Tōkyō. Those came to be called tsurekomi yado or "bring-along inns". When prostitution was made illegal and pushed underground in 1958, the love hotel business boomed. Some have truly garish architecture. 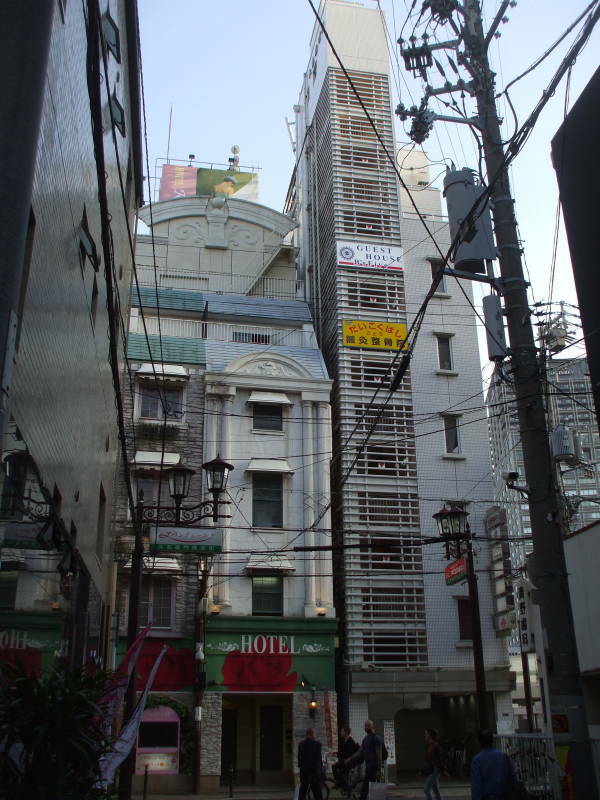 The one shown below is very mild by love hotel architectural standards. Others are bunker-like with no windows and partially underground hidden entrances. Some love hotels have underground parking. A garage door rolls down behind an entering car. Once inside, any interaction with staff is minimized. Payment might be through a slot in a frosted glass panel. Or it might all be automated, with room selection via an array of room pictures with push buttons and slots to enter money. Much like how you pay for a meal at many ramen shops, where you choose and pay at a machine outside and bring your ticket to the staff inside. The same concept exists in many countries around the world. In Latin America they are often called autohotels, motels, or telo. In Mexico, Brazil, Columbia, and Puerto Rico the word motel is used exclusively for this type of operation. Shinsaibashi is Osaka's main shopping district. 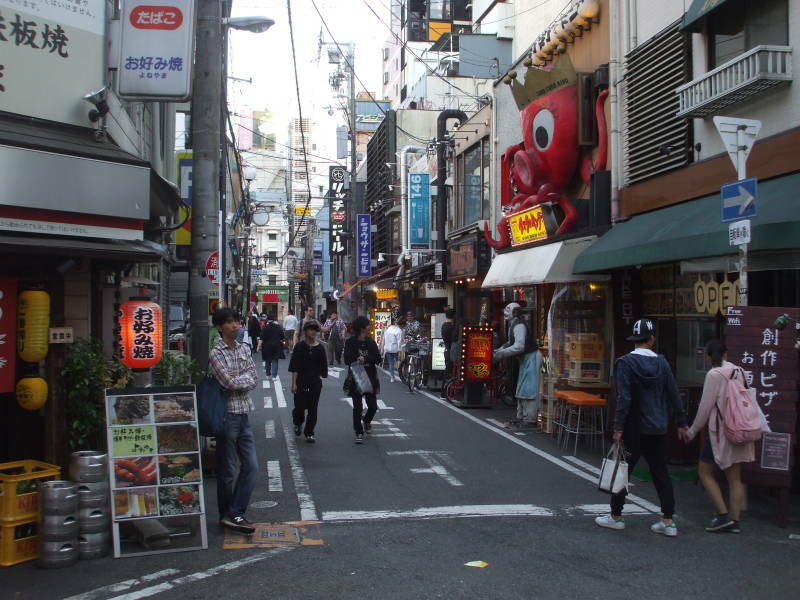 It's north of Dōtonbori, running north and south parallel with and east of the prominent Mido-suji street. Amerika-mura, more youth oriented, is just another block on to the west of Mido-suji. Some of the high-end stores of Shinsaibashi are on Mido-suji. Others are a block east on Shinsaibashi-suji, a long covered shopping arcade. Filled with crowds, it disappears to a vanishing point in the far distance. 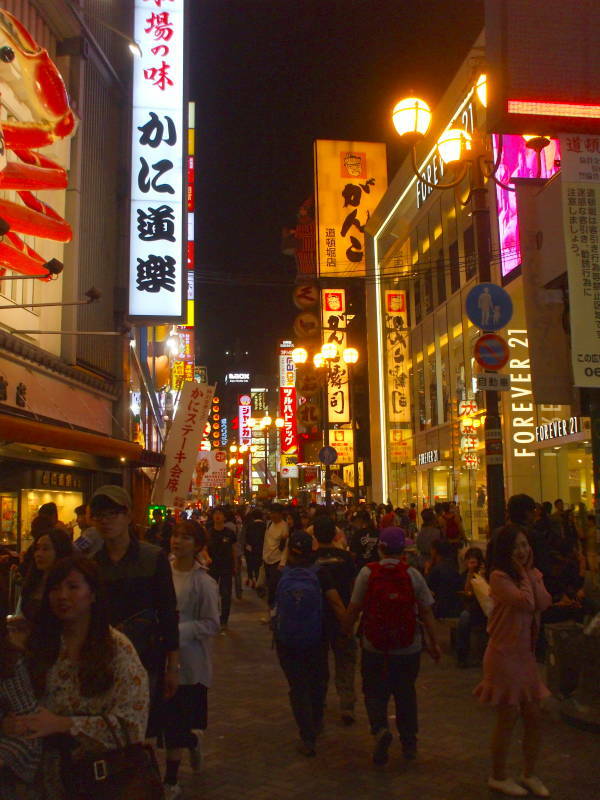 Dōtonbori or Dōtombori is an entertainment district along Dōtonbori-gawa, the Dōtonbori Canal. The advertising is colorful during the day, and more so at night. 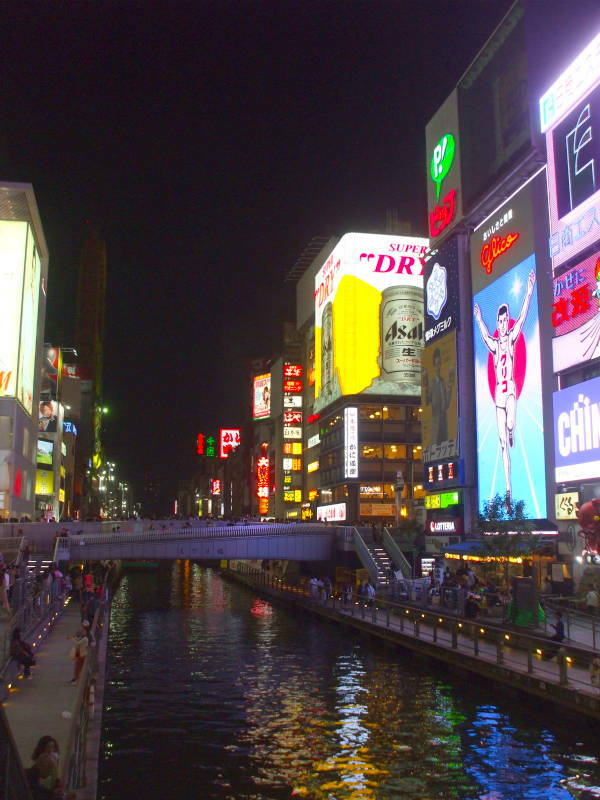 The illuminated sign showing a runner, an advertisement for the Glico confectionary company, serves as a symbol of Osaka across Japan. A local businessman dug the canal in the 1610s. The Tokugawa Shōgunate established urban planning in 1621, and designated the area along the canal as Osaka's entertainment district. 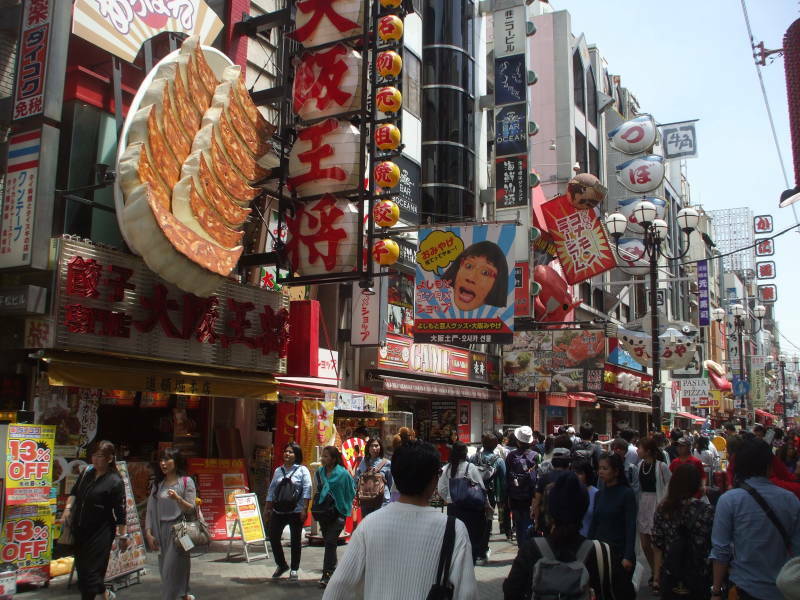 By the 1660s many theaters, restaurants, and cafes were operating in Dōtonbori. 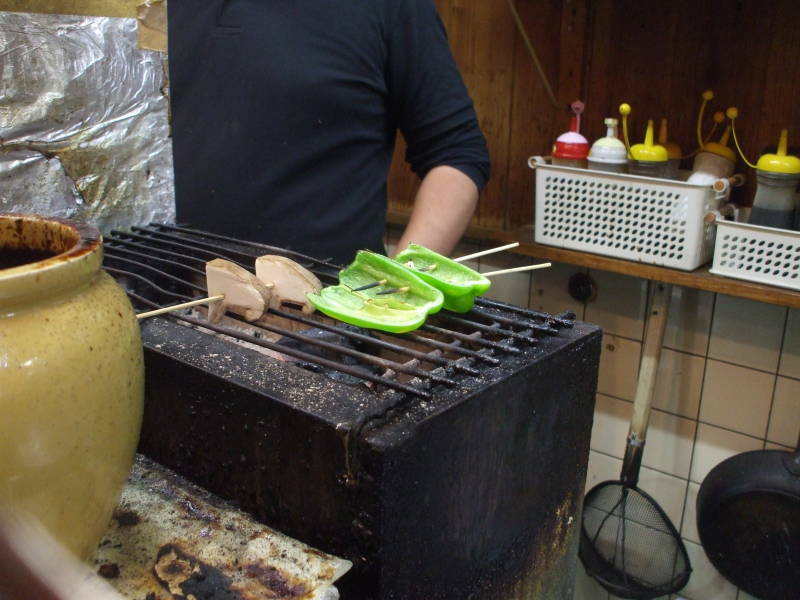 There are plenty of small izakaya where you can get yakitori and other grilled dishes. 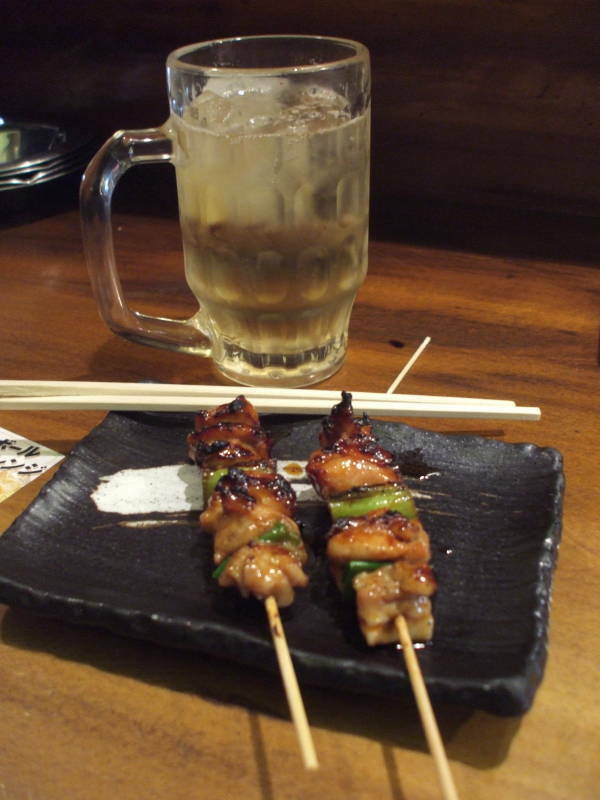 The Japanese word kuidaore means something like "to ruin oneself by extravagance in food." 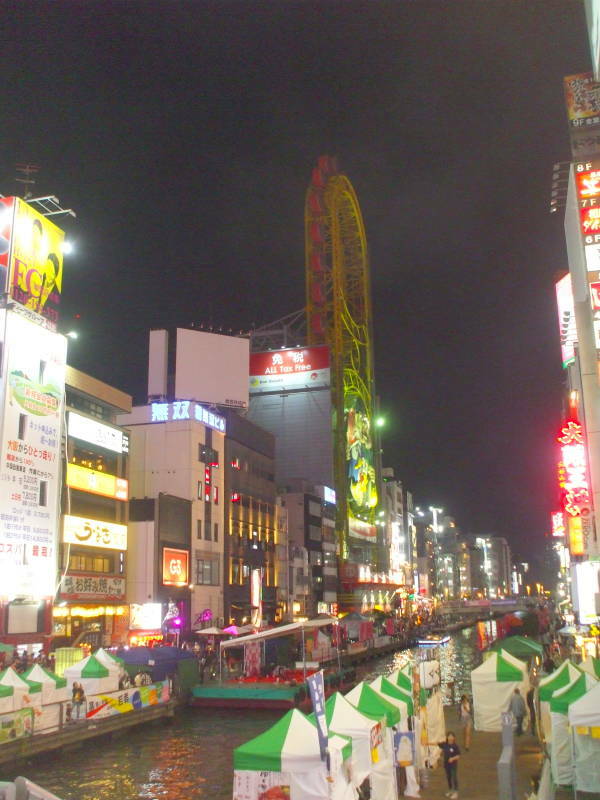 Kuidaore is used in advertisements and tourist guides about Dōtonbori. It's part of a national proverb, "Dress into ruin in Kyōto, eat into ruin in Osaka."